This monster bud is typical for deep water culture grow ops. 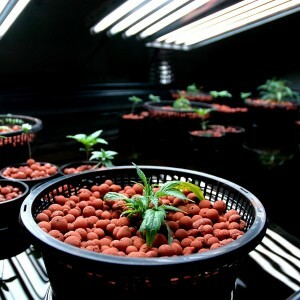 Deep water culture is a high-yielding method of pure hydroponics marijuana growing. In deep water culture gardening your cannabis roots sit in buckets filled with aerated, circulated, nutrients-rich water. Sometimes, the top portion of the buckets contains grow stones, hydroton, netting or other materials that help stabilize the cannabis plants in the buckets or other DWC containers. It’s more hassle to set up a deep water culture (DWC) system than it is to set up a soil grow, or a hydroponics systems such as drip irrigation or ebb and flow. There’s more hassle to run a deep water culture system too. So why do it? Because deep water culture delivers more hydroponics nutrients and oxygen to roots in a very efficient way, it supercharges marijuana plants for faster growth and bigger yields. When you look at the healthy, pure white, dense, incredible root mass that marijuana plants generate in deep water culture systems, you see the power of DWC. Deep Water Culture is best described as a hydroponic system where the marijuana plant’s root mass is submerged directly into the nutrient solution contained in the growth module. DWC modules are often made from buckets, or even from Rubbermaid containers. Sometimes, each cannabis plant is in its own DWC container but sometimes you’ll see systems with multiple plants in a single container. You need a reliable pump and irrigation system to ensure proper operation of DWC. Usually, air pump output is rated by the amount of liters of air per minute the pump expels. When purchasing your air pump make sure it’s large enough to supply each plant module with a minimum of 5 liters of air per minute. For example, an air pump with a rating of “30 liters of air per minute” would be suitable for six modules in a Deep Water Culture system. When setting up a deep water culture system, you have to decide whether you want a closed or recirculating system. In a closed system, each plant module is essentially its own reservoir. Any adjustments to PPM or pH need to be made to each individual plant if plants are in individual non-circulating containers. This is an acceptable workload for small cannabis gardens, but for large or commercial marijuana gardens, a recirculating system makes way more sense. A recirculating Deep Water Culture marijuana garden has a central reservoir that feeds each plant module, usually via top feed. As the plant module fills, gravity pushes the solution through the return line at the bottom of each module and back to the reservoir. Adjustments to PPM and pH are to be made within the main reservoir, of course. 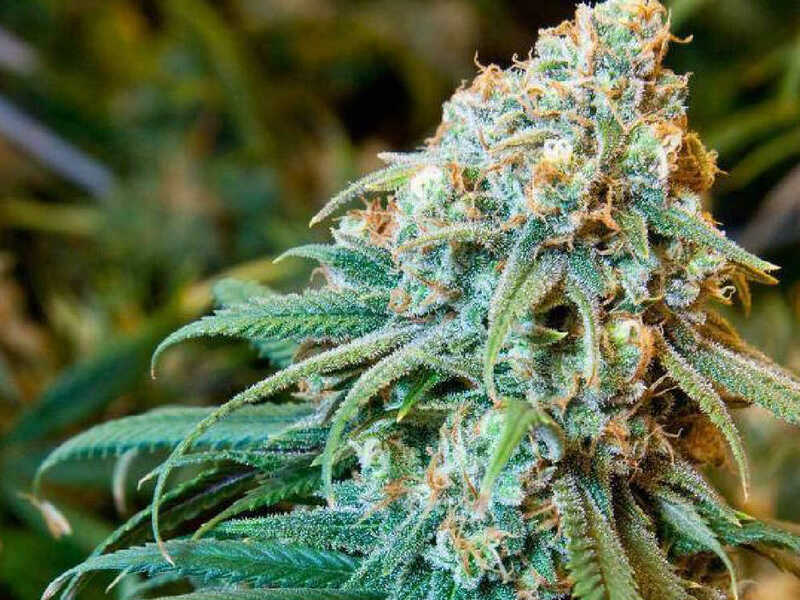 Oxygen supplied directly to marijuana roots combined with marijuana roots being submerged in hydroponics nutrient solution results in unbelievably fast absorption of nutrients, allowing your cannabis plants to perform photosynthesis in an almost hyperdrive manner. DWC grow ops can develop problems if harmful bacteria, algae, nutrients, water or other factors get into the system. You also have to use only the best hydroponics nutrients made for marijuana. 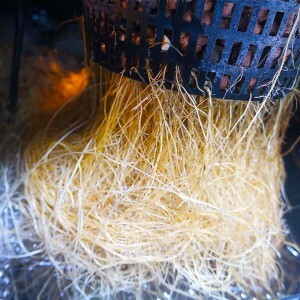 Deep water culture is far less forgiving than grow systems where solid media such as soil, rockwool, and coco coir provide at least some form of pH and nutrients buffering that protects marijuana roots if there are problems such as inferior nutrients, overfertilization, and other common issues. Many DWC growers have had their crops ruined by crappy hydroponics nutrients. And DWC systems need totally reliable electricity supply all the time. An electrical outage can quickly turn into crop failure. When DWC reverse osmosis water temperatures are in the optimal range (67-71°F), and you’re using quality marijuana-specific hydroponics nutrients such as Connoisseur base nutrients that automatically adjust pH, you get a high-powered growing system for creating huge buds faster. Please check out our three-part series that gives you more information about maximizing deep water culture systems.